Eva (Julia Louis-Dreyfus) is staring down at an empty nest. After a long stretch of post-divorce loneliness the middle-aged masseuse may have found her winter romance—not that she’d describe it that way. She meets Albert (James Gandolfini) and Marianne (Catherine Keener) at the same party and gets a date and a massage client (respectively) at the same time. It doesn’t take her terribly long to realize the ex-husband Marianne’s venting about is her would-be BF. It’s self-preservation that drives Eva to treat her new friend as a “human trip advisor” and to a certain extent everyone considering a second marriage does this sort of temperature taking: “so, what went wrong?” really means “what’s wrong with you?” and the way writer/director Nicole Holofcener frames it you’ll wonder if it ever meant anything else. Holofcener (Friends with Money has the slightest sense of humor and within the first few minutes of Enough Said she checks your taste for it; Eva carries a massage table up a flight of stairs while her male client patiently watches. Is it funny because he never considers helping or is the world’s smallest violin playing a solo for the death of chivalry? Less a belly laugh than a contemplative chuckle (she saves the belly laughs for later) her kind of punch-line is funniest if you stumble upon it. Somehow the way she picks up tiny tragedies from the wastebasket and gives them a saltbath in sidelong humor is a gently heroic gesture, a redemptive sweet nothing. She loves these characters. Few people are cruel in her films, but fewer are trying to make life better for anyone else, and that’s the rub; self-preservation will always trump loving care in the world of new romance. That’s the mistake we keep making. The thing that makes life good is a perpetually evolving mystery she chips away at like a sculptor, and she finds a new Venus in Louis-Dreyfus. The chemistry between Eva and Albert is so tentative and casual you’d think it could break. Marianne’s descriptions of Albert (fat, slob, loser) grow more insulting the more Eva listens but she keeps taking it like medicine, all the while ignoring the way she turns each bit of intel into a self-fulfilling prophecy. Why did Eva’s marriage end? She couldn’t really say, which may be more incriminating than knowing. If it doesn’t have an answer, can it be called a question? Wish we could ask the guy who can’t envision an alternative to watching a tiny woman drag a massage table up the concrete staircase. Holofcener is constantly asking what all these actions mean, all the while building a world full of happenstance, so much of it tragic. 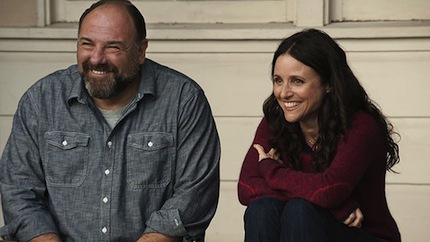 Speaking of tragedies: It’s clear from his performance here that Gandolfini had nothing but brighter things ahead. He’s never been more lovable; terrible few have.